Right after the game, the Yankees sent him to Triple-A Scranton Wilkes-Barre. 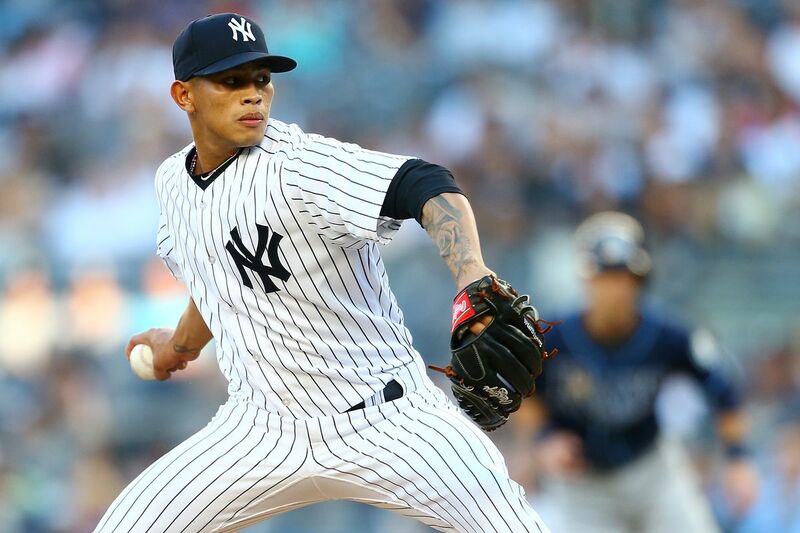 In his first start, last Wednesday against Detroit, Loaisiga went four innings, allowing a run on one hit and three walks, with four strikeouts in an eventual 2-1 Yankees loss. On Wednesday morning, the Yankees called up right-handed pitcher Joe Harvey. The 27-year old was selected by the Yankees in the 19th round of the 2014 First-Year Player Draft. In his professional debut in 2014, he spent the majority of the season with short-season Single-A Staten Island, where he made 13 relief appearances, throwing 18.1 innings, allowing 4 earned runs, 16 hits, and 3 walls, with 16 strikeouts. He went 0-2 with one save and a 1.96 ERA. In 2015, he pitched with their Single-A Charleston affiliate, where he he went 1-1 with eight saves and a 4.24 ERA (17 IP, 20 H, 9 R/8 ER, 8 BB, 21 K) in 15 relief appearances. Harvey spent the 2016 season at the Gulf Coast League Yankees East and West teams, as well as Staten Island. He combined to go 0-1 with a 0.84 ERA (21.1 IP, 17 H, 2 ER, 4 BB, 19 K) in 11 appearances, including five starts. In 2017, with Single-A Tampa, Harvey went 1-0 with four saves and a 1.05 ERA (25.2 IP, 13 H, 3 ER, 8 BB, 29 K, 2 HR) in 18 relief appearances. Opponents batted .148 (13-88) against him. Harvey made the big jump in 2018, as he pitched at Double-A Trenton and Triple-A Scranton/Wilkes-Barre. He combined to make 43 relief appearances, going 3-2 with 11 saves and a 1.67 ERA (59.1 IP, 34 H, 12 R/11 ER, 25 BB, 68 K, 2 HR). His 11 saves were tied for most among Yankees minor leaguers, and he set career highs in appearances, innings pitched, saves, and strikeouts. Following the season, he pitched for Toros of the Dominican Winter League, holding opponents to just one hit and one walk, with seven strikeouts, in 3 2/3 scoreless innings over four relief appearances, with two saves.